New Hollywood is a Deadline podcast hosted by Amanda N'Duka and Dino Ray Ramos. Each week, they welcome a member of the entertainment industry as they discuss their unique journey and how the landscape of Hollywood is changing. Formally The Deadline Podcast. Marsai Martin (@marsaimartin) joins Amanda and Dino to discuss her work on Black-ish and the movie "Little". Produced by David Janove. Marta Milans (@martamilans) joins Amanda and Dino to discuss her career, cheese and her role in the new movie SHAZAM! Produced by David Janove. Gloria Calderón Kellett (@everythingloria) joins Dino to talk about her career and One Day At A Time (#RenewODAAT). Produced by David Janove. Lashana Lynch (@LashanaLynch) joins Amanda and Dino to discuss her career and role in Captain Marvel! Produced by David Janove. Avan Jogia (@AvanJogia) joins Amanda and Dino to discuss his new show 'Now Apocalypse' as well as what they thought about the Oscars. Produced by David Janove. Amanda, Dino and Producer David discuss the 2019 (or is it 2018) Academy Awards. Produced by David Janove. Costume Designer Ruth Carter joins Amanda and Dino to discuss her career and work on the Oscar nominated Black Panther. Produced by David Janove. Live from Sundance, Amanda and Dino welcome the filmmakers of the films 'Where's My Roy Cohn?' and 'Bedlam'. Presented by Visit West Hollywood. Michael B. Jordan (@michaelb4jordan) joins Amanda and Dino to discuss his work on Black Panther and Creed II, as well as his production Company 'Outlier Society'. Produced by David Janove. Jorge Lendeborg Jr. joins Amanda and Dino to discuss his work on 'Love, Simon' and 'Bumblebee'. Produced by David Janove. Amanda, Dino and David discuss 2018, and the movies and television that have had the biggest impact towards diversity and inclusion. Produced by David Janove. Yahya Abdul-Mateen II (@yahya) joins Amanda and Dino to discuss his new film Aquaman. Produced by David Janove. Jovan Adepo (@JovanAdepo) joins Amanda and Dino to discuss his career and work on the film Overlord. Produced by David Janove. Stephan James (@realstephj) joins Dino and Amanda to discuss his projects 'Homecoming' and 'If Beale Street Could Talk'. Produced by David Janove. Michelle Yeoh joins Amanda and Dino to discuss her career and work on the film "Crazy Rich Asians". Produced by David Janove. Steven Caple Jr. (@stevencapleJR) joins Amanda and Dino to discuss his career and his new film "Creed II". Produced by David Janove. John David Washington joins Amanda and Dino to discuss his career and work on the movie "BlackKklansman". Produced by David Janove. Amandla Stenberg joins Amanda and Dino to discuss her career and work on "The Hate U Give" and "Where Hands Touch". Produced by David Janove. Charmaine Bingwa (@CharmaineBingwa) joins Amanda and Dino to discuss being an up and coming LGBTI filmmaker of color in Los Angeles. Produced by David Janove. Steven Yeun (@steveyeun) joins Amanda and Dino to discuss his career and work in the new movie "Burning". Produced by Andrew Merrill and David Janove. Robia Rashid joins Amanda and Dino to discuss her show 'Atypical'. Produced by David Janove. Geoffrey Owens stops by to talk to Amanda and Dino about his career resurgence, the legacy of The Cosby Show and what his favorite foods at Trader Joes are. Produced by David Janove. Amma Asante, director of 'Belle', joins Dino and Amanda to discuss her new film 'Where Hands Touch'. Produced by David Janove. Yvonne Orji (@YvonneOrji) joins Amanda and Dino to discuss her role on Insecure and what's it's like bringing her values to the entertainment industry. Produced by David Janove. Amanda N'Duka is joined by a panel of female filmmakers, including Ivy Agregan, Gillian Barnes, Janine Sherman Barrois, Gillian Jacobs, AM Lukas, Jessica Sanders and Yara Shahidi, as well as Refinery 29's Amy Emmerich and Shannon Gibson. Adina Porter (@AdinaPorter) joins Deadline's Amanda N'Duka and Dino Ray Ramos to discuss her Emmy nomination and work on American Horror Story. Produced by David Janove. Jimmy O. Yang (@FunnyAsianDude) joins Deadline's Amanda N'Duka and Dino Ray Ramos to discuss his career and work on Silicon Valley and Crazy Rich Asians. Produced by David Janove. Daveed Diggs (@DaveedDiggs) and Rafael Casal (@RafaelCasal) joins Deadline's Amanda N'Duka and Dino-Ray Ramos to discuss their new film "Blindspotting". Produced by David Janove. Diane Guerrero (@dianeguerrero__) joins Deadline's Amanda N'Duka and Dino-Ray Ramos to discuss her career and book 'My Family Divided'. Produced by David Janove. Justin Chon (@justinchon) joins Dino and Amanda to discuss his show Deception, as well as his career in roles such as the Twilight saga. Produced by David Janove. DeWanda Wise joins Deadline's Amanda N'Duka and Dino Ray Ramos to discuss her show She's Gotta Have It. Produced by David Janove. The cast and showrunner of Queen Sugar join Deadline's Dino Ray Ramos and Amanda N'Duka to discuss their show live from the ATX Festival! Sonequa Martin-Green joins Deadline's Dino-Ray Ramos and Amanda N'Duka to discuss her CBS All Access series "Star Trek: Discovery". Produced by David Janove, music by Pete Blyth. Tommy and Codie Oliver join Deadline's Dino-Ray Ramos and Amanda N'Duka to discuss their OWN series "Black Love". Produced by David Janove, music by Pete Blyth. Anna Akana joins Deadline's Dino-Ray Ramos and Amanda N'Duka to discuss her Youtube Red series "Youth & Consequences". Produced by David Janove, music by Pete Blyth. Will Yun Lee joins Deadline's Dino-Ray Ramos and Amanda N'Duka to discuss his career and his role on The Good Doctor. Produced by David Janove. 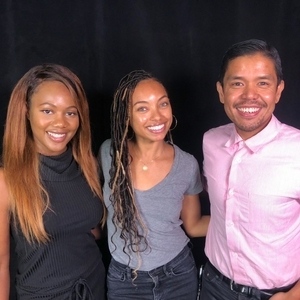 Logan Browning joins Deadline's Amanda N'Duka and Dino-Ray Ramos to discuss her career and work on "Dear White People". Produced by David Janove. Justin Simien joins Deadline's Amanda N'Duka and Dino-Ray Ramos to discuss his career and work on Dear White People. Produced by David Janove. Adria Arjona joins Deadline Hollywood's Dino-Ray Ramos and Amanda N'Duka to discuss her career and her role in Pacific Rim 2 and Life of the Party. Produced by David Janove. Jeffrey Bowyer-Chapman joins Deadline's Dino Ray-Ramos and Amanda N'Duka to discuss his career and role on "unReal". Produced by David Janove. Music by Pete Blyth. Darren Criss joins Deadline's Dino-Ray Ramos and Amanda N'Duka to discuss his career and work on American Crime Story: Versace. Produced by David Janove. Music by Pete Blyth. Shangela from Ru Paul's Drag Race All Stars joins Deadline Hollywood's Dino Ray Ramos for a discussion about her upcoming projects including competing on Drag Race All Stars. Produced by David Janove. Wilson Cruz joins Deadline's Amanda N'Duka and Dino Ray-Ramos to discuss his career and his role on Star Trek Discovery. Produced by David Janove. Lena Waithe joins Deadline's Amanda N'Duka and Dino Ray-Ramos to discuss her work on Master of None and her new show The Chi. Produced by David Janove. Brian Tyree Henry joins Deadline's Amanda N'Duka and Dino Ray-Ramos to discuss his career and his work on the upcoming season of Atlanta Robbin'. Produced by David Janove. Winston Duke joins Deadline's Amanda N'Duka and Dino Ray-Ramos to discuss his career and role in Black Panther. Produced by David Janove. Letitia Wright joins Deadline's Amanda N'Duka and Dino Ray-Ramos to discuss her role in the new movie Black Panther. Produced by David Janove. Phoebe Robinson (2 Dope Queens) joins Deadline's Amanda N'Duka and Dino Ray-Ramos to discuss her new HBO specials. Produced by David Janove. Keala Settle ("The Greatest Showman", Broadway's "Waitress") joins Deadline's Amanda N'Duka and Dino Ray-Ramos to discuss her work on The Greatest Showman. Produced by David Janove. Actress/Writer Diarra Kilpatrick joins hosts Amanda N'Duka and Dino-Ray Ramos to discuss her series "American Koko". Produced by David Janove. Actor Sinqua Walls joins hosts Amanda N'Duka and Dino-Ray Ramos for the inaugural episode of New Hollywood.